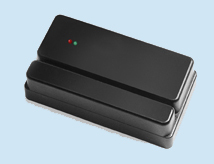 The B400 is a low cost barcode reader designed for OEM applications. It is available with either wiegand emulation, magnetic stripe emulation (ABA), F2F, or serial (TTL or RS232) outputs. The B400 will read bi-directional Code39 or I2/5 barcodes, with a maximum barcode length of 18. These readers are factory programmable to your specifications. The B400 is available as an OEM product only.